This April saw us join forces again with the wonderful Oxford Preservation Trust to celebrate Shakespeare’s birthday. It was a weekend full of talks, tours, monologues and music. It began on the Saturday morning at the Lord Mayor’s Parlour in the Town Hall for a speech by the Lord Mayor, accompanied by some wonderful Elizabethan musicians. Our very own Drama Clubbers then impressed the audience with a wide selection of Monologues honouring the Bard – from Juliet to Puck and all things in between. After the performance we took a parade led by the Town Cryer to the Painted Room – a room Shakespeare himself stayed in and is being brilliantly preserved by the OPT. The students performed another round of Monologues here and a talk was given by a Shakespearean expert! We met again on the Sunday for Shakespeare’s trail led by Debbie Dance of OPT. A trail to commemorate Shakespeare’s relationship with Oxford (lesser known but very much there)! 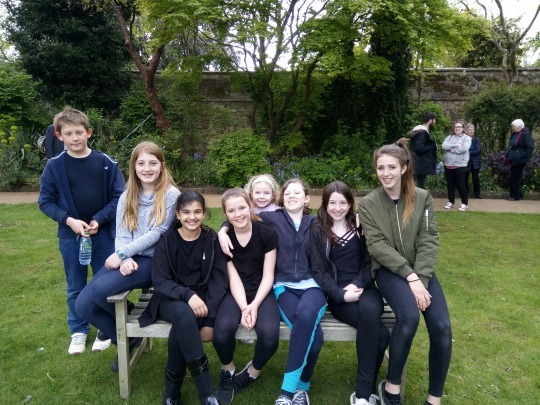 Along the route members of the trail got to experience some pop up Hamlet from our Drama Clubbers – the ghost in the Painted Room, Ophelia’s death in the grounds of Wadham College, the ‘play within the play’ on the steps of the Weston Library and much more! Not only did the children experience first hand the joys of performing in site specific locations but they impressed greatly while doing so. We at Creation Theatre are so proud of their talents and professionalism!